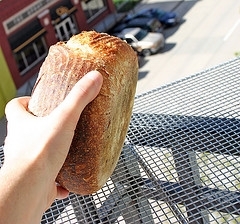 Listening Post #13: Social Service Providers: Does Your Bread Give Life? There’s a triumvirate of savvy survivors at St. Francis Inn in Kensington; around the holidays they took to the name of the Three Wise Men. It’s an insightful, articulate band of brothers who provide astute social analysis and humor from time to time. A modern Greek Chorus, (a reference they doubtless grasp) they provide insightful commentary on the local scene and what it takes to survive living on the razor’s edge in Philadelphia. Recently, the topic du jour was the relative merits of various meal centers in the Philadelphia area: where is the food good, where is the environment downright hostile, where can one expect a sub-ambiance of incipient violence? All agreed that St. Francis Inn, in whose yard we were standing, is ‘The Gold Standard’. It’s not even that the food is generally tasty and plentiful; it’s the attitude with which it is dispensed that makes this a favored, even beloved spot. The consensus was that here, no one is made to feel guilty; no one is shamed, patronized, or ignored. Those already in possession of copious self-loathing do not find it added to; people are not invisible; they feel SEEN. This, the group avers, is a relief and a distinctly different experience from most other ‘feeding’ sites. (Think about that term; doesn’t it sound like something that happens at zoos?) It’s the human connection that makes the Inn the best dining room in the city. Anon is an urbane, articulate man whose quick wit and instant-analysis provide regular moments of mirth and thought-provoking, pithy insight. The problem, he says, is that in the social services delivery system, there is way too much “generosity without kindness”. This, he says, is a contaminated effort to help; whatever food or assistance is given is offered carelessly and grudgingly, infecting the act, increasing shame, engendering resentment. “They process people,” he says, and a friend chimes in “The help is no help.” It may be food, but it doesn’t nourish. Dolly joins the conversation to take issue with Anon’s terminology (they engage in verbal fencing regularly). “It isn’t generosity at all,” she says; “sometimes it’s meanness”. When asked why someone would feed the hungry but do it unkindly, she grows thoughtful, shakes her head, observing that ”No one knows what puts a hole in the soul of another”. A hole in the soul….kindness here extended to those who do not offer it to her. One could wish that everyone who has grown mechanical and unfeeling in the service of people on life’s edges would really listen to what the Wise Men and Dolly are saying. Work and effort that begin in genuine care can become heartless and hurtful to those who are already massively wounded unless we constantly nurture the compassion, kindness, and love that live somewhere inside each of us, giver and receiver alike. Whether the service proffered is medical, legal, social, or nutritional, the spirit it which it is given has at least as much impact as the service itself. If any of us finds ourselves ‘giving’ with resentment and fatigue, practicing ‘generosity without kindness’, treating others with behaviors arising from a “hole in the soul”, perhaps it is time to consider taking a break, doing other work for awhile. To paraphrase Frederick Buechner, we should take some time to figure out where “the intersection of our deepest joys and the world’s greatest needs” lies, and then undertake that important work, lest we do more harm by adding to the burdens of those already bowed under the weight of their wounds. Be kind, to yourself, and to those with whom you labor. Loving kindness is an enriched bread: it gives Life. Much as the general theme makes sense (give with your heart, smile with the eyes, ie, be genuine in what you do)i would not ask those who cannot be as genuine to stop. A hungry man cares more for the food in your hand than that genuine kindness be reflected in your giving gesture. A sick child would benefit from that vaccine, or the malaria drugs, just as well even if the person who donated the funds to buy those drugs didn’t really give a hoot about that kid. I doubt a homeless person would prefer to sleep in the cold streets of your country if s/he had a choice to stay somewhere warm, even if it wasn’t a kind place. We have a saying: A man with a full stomach has no problem talking of fasting. I do not wish to be critical, and find hard to avoid sounding so.